Fun Facts About Sushi for International Sushi Day | Gastrointestinal Specialists, Inc.
June 18th is International Sushi Day and we here at Gastrointestinal Specialists hope you partake! Why? Becuase Sushi can be a very healthy meal. Here are some fun facts to know about the favorite Japanese food. 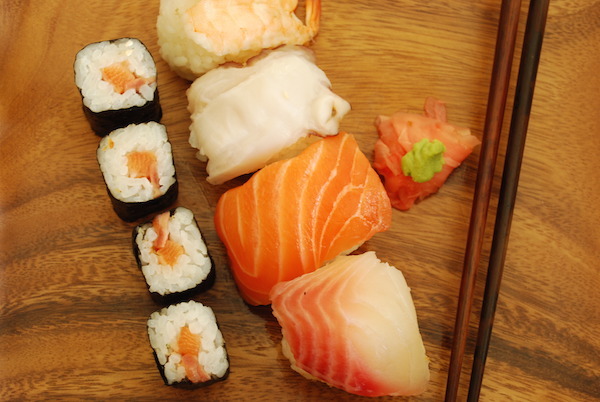 Sushi dates back to at least the second century A.D., beginning as a method of preserving fish in China. The word “sushi” actually refers to rice that has been seasoned with vinegar, sugar, and salt, and contrary to popular belief, Sushi does not mean raw fish at all. Nori is the seaweed found wrapped around the outside or inside of the rice in a sushi roll. It is packed with vitamins A, B-6 and C and is very low in calories. Fish is high in protein, omega-3 fatty acids and vitamin D. Choosing “Sashimi” or raw rolls packs an eve healtier punch as they are made with tuna or salmon – two fish that are loaded with omgea 3s are very good for you. Avacado, carrots and cucumber are the most popular veggies used in Sushi – all veggies that are low in calories but high in nutrients. Don’t forget to partake in the wasabi and ginger that accompany your sushi roll! Spicy wasabi contains antioxidants and pickled ginger is an antimicrobial and antiviral agent that helps boost your immune system. Ginger is also a good source of potassium, magnesium, copper, and manganese. Despite the great benefits listed above, there are a few ways to go overboard healthwise with Sushi. The crunch – crunchy rolls are deep fried and thus negating all of that healthy goodness that a sushi roll can provide. The Soy Sauce – Soy Sauce is extremely high in sodium so try using the low sodium soy sauce if you plan to use it. The Roe – Roe is high in cholesterol. While there isn’t a lot of roe on one piece if you’re eating several it can add up. You can always ask for no roe when ordering. The Cream cheese and saucy rolls – Many of the specialty sushi rolls have cream cheese (hello Philly Roll) or a special sauce that is undoubtedly amazing but most likely made with mayonnaise. Skip the special rolls and stick to the wholesome ones. While it may not seem like much, it’s easy to pack on the calories and fat. Now that you know the health breakdown, the next question is, where in Richmond should you go to find sushi? Here are some popular places to grab a roll.